Jonathan Case feels like a bit of an anachronism. That sounds insulting, but I don’t mean it as such. As an artist, he’s always had a rare ability to transport readers to other times – the period of the Green River Killer or whenever the haunting story of The Creep went down, for two – and create such convincing atmosphere that the events on the page don’t just feel well told; they feel authentic. He does that job well enough that it sometimes feels he’s of that era himself, an artist out of time that’s enough of a chameleon that he can fit anywhere. That malleability is an important characteristic for a cartoonist, as nothing takes readers away from stories more than aspects that just don’t seem to fit. The ones that make the mind ask questions about whether that makes sense rather than just rolling with the story. But even beyond that, it just seems like he appreciates the sensibilities of a bygone era. His library backs that up. And no work he’s crafted yet showcases that more than The New Deal, his recent graphic novel from Dark Horse Comics. From a 10,000 foot view, it’s a story of how two goodhearted employees of the Waldorf Astoria in the 1930’s get wrapped up in a series of thefts that started shortly after a beautiful and beguiling guest checked in. It often feels like it shares a heart with some of Frank Capra’s classic films but a brain with the more clever, fast talking stories crafted by some of Capra’s contemporaries of the era. That’s a hard combination for many. In another creator’s hands, this tale could have faltered in any number of ways. However, Case’s abilities as a cartoonist help infuse the story with everything it needs to not just work, but thrive. That’s another way Case feels like a throwback. Some artists have a tendency of sacrificing story for style. They find a way to stand out by using complicated layouts that when glanced at are alluring, but when read are befuddling. It’s a problematic approach in a narrative art form. Case is not one of those artists. A major part of why The New Deal is as good as it is falls upon his exceptional cartooning abilities. Styles come and go, but the ability to give humanity to characters and effectively tell a story? That’s timeless. He gives each of the three leads – Frank, the walking failure with the heart of gold; Theresa, the aspiring actress/good girl; and Nina, the irresistible and intoxication bad influence at the core of the story – a visual identity that makes them each feel real and charming in a way few could convey. It’s a small story, sure sure, but it feels as big as life can get because of how Case compels us to invest in these characters. And what’s not to love? Case’s expressive character work – from the evil glares Theresa often burns Frank with to the gleeful idiocy he displays in his wide eyed grins – opens up the heart of the story. He gives each of them their own cadence and style in dialogue as well, and it furthers their identity beyond the visual. Nina’s casual swings between hoity-toity and hoi polloi are especially enjoyable, as are the unique sick burns she levies upon characters like the appropriately nicknamed “Declarative-Statement Man.” They’re a winning set of leads, and mostly not in the sense of any actual victory. For at least Frank and Theresa, they’re little fish caught in a big pond that never stop feeling like they’re destined for something more. Who doesn’t feel like that at times? Case knows that, and keeping his leads relatable makes us actively root for them. Case also does a phenomenal job of realizing the look of the era. Whether its the broad chested, double breasted suits of explorer/socialite/generally rich guy Jack Helmer, Nina’s perpetually chic ensembles or the array of over-the-top and era-accurate hats, the sartorial selections are worth the price of admission alone. He also doesn’t skimp on architecture, delivering faithful representations of esteemed buildings like the Waldorf Astoria and the Lafayette Theater. It’s not just the art, though, as he bakes in era-specific elements like Orson Welles’ Voodoo Macbeth that help further realize this world. Detail is often only mentioned when something is off (or missing entirely), but Case deserves equal credit for ensuring these aspects met the mark. It enriches the world and the story taking place within it. The watercolor washes Case uses throughout the story are also lovely. Some may be put off by the lack of color – I’m not one of them, but some may be – but the way Case uses the washes give the world the texture it needs to work. It’s a low-key, human story, and the washes are a good, simple solution to giving the art the depth it needs. It’s worth noting that they also feel like a better match for the timeframe of the story than computer generated colors would have been. While the art was the show stopping element of the book, the thing I loved most is a bit harder to express in intelligent sounding ways. So I’ll go for the simple route: this book made me smile. There are a lot of comics out there that wear the weight of the world on their shoulders. 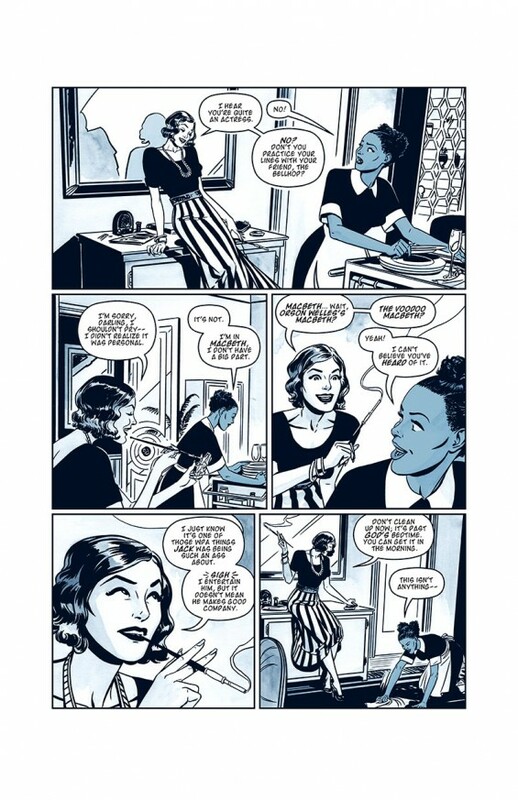 Everything’s all “the Master Race this” or “Secret Wars that,” but The New Deal is a charming story about three likable people finding themselves and solutions to their problems. It’s not designed to be big, and that helps. There are hijinks and misunderstandings and standup guys and knockout girls, and there’s a lot of fun in-between. Today’s era of stories are all about the elevator pitch – “it’s like Alien but for people who fear cat memes!” – and Case’s story isn’t interested in that. It’s a very human and heartfelt story with charisma for days, and it doesn’t bog itself down with trying to be something other than what it is. Like I said, Jonathan Case may be an anachronism in some ways. He seems to be in love with stories from other eras. He delivers those stories with a real sense of authenticity. And his art delivers the story in simpler and less showy ways than most. But it’s because of those things and more that his work feels so refreshing. 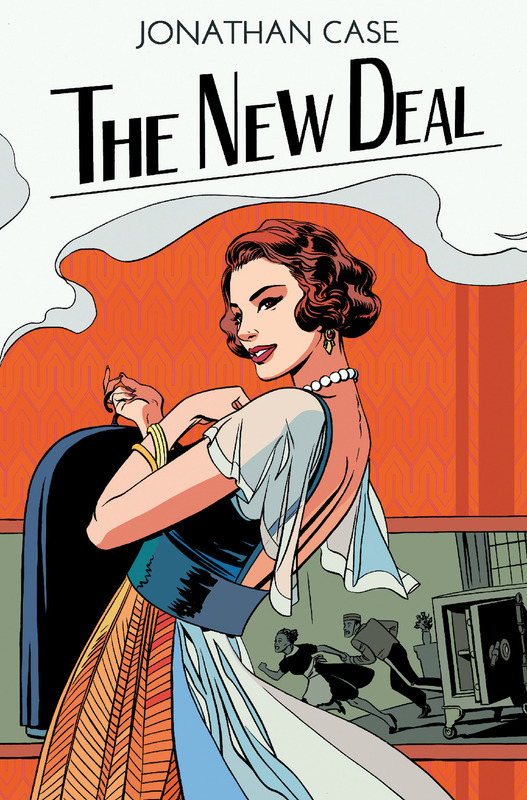 The New Deal is a graphic novel that finds a gifted cartoonist at the top of his game, beautifully blending the written word and exceedingly lovely art into something wonderful: a wildly enjoyable comic. Was it a release that will change the medium forever? Nope. But it was a story that brightened my day and stuck with me enough that I wanted to revisit the world soon after first experiencing it. And that’s the type of throwback I can get behind. You can pick up The New Deal at your local comic book shop, at varying online retailers, or on ComiXology if you’re so excited you just can’t wait another second.